A handful of cities like Georgetown, Texas, and Greensburg, Kansas, have gone 100 percent clean energy, getting all of their electricity from sources like wind, solar or hydropower. Now, over 500 cities are following in their footsteps, committing to go big on clean energy–saving their constituents money and cutting pollution along the way. 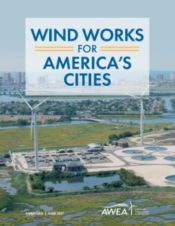 To help the effort, AWEA has released a new brochure, Wind Works for America’s Cities, which provides information on how cities can purchase clean, affordable wind energy and offers many examples of cities that have already done so. Click here to read the entire blog post. This entry was posted in Nebraska / Midwest News, NewsBlog and tagged 100% renewable-powered cities and towns, American Public Power Association (APPA), American Wind Energy Association (AWEA), green tariffs, Mayors For 100% Clean Energy, Nebraska's Green Tariff, U.S. cities and towns with 100% renewable energy goals on August 31, 2017 by Helen Deffenbacher.